One of the great coaching myths about sprinting is that the elbow joint should remain locked at 90 degrees, fixed throughout the movement. Carefully observing most great sprinters will reveal this is not the case. The elbow angle changes during the arm stroke (Tellez). Viewed from the side, at the top of the up-stroke, the elbow joint on most of the world’s fastest sprinters bends to around 40 degrees (Pfaff). 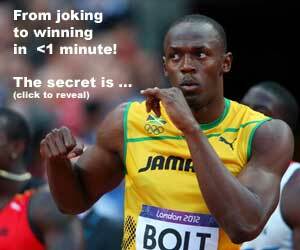 Some like Usain Bolt and Michael Johnson can be observed to close the angle even further. At the top of the upswing, the forearm and bicep/humerus are nearly touching with the hand close to the chest (Universal Sports). On the down stroke, the elbow should open up to almost straight – 150 to 170 degrees. This down stroke will produce a movement where the wrist passes below the hip socket as it moves back. Finally at the back end of the movement, where the arm goes behind the runner, the elbow joint closes again (Tellez). This back-side elbow angle is around 90 to 120 degrees and occurs just as the back-swing hits its conclusion. The arm then swings forward, and the elbow joint begins to close again in front of the body. The front and back strokes also finish simultaneously to impart forces (Pfaff). These movements are necessary and correlate to knee joint movement that also undergoes changes in angles too — Opening on the way down, and flexing on the way forward/up. For example, one wouldn’t see an efficient sprinter’s knee rise forward with an open angle of the knee joint. On the contrary, the leg folds at the knee joint on the way up such that the ankle passes close under the pelvis, and steps over the knee of the support leg on the other side (Francis). The knee joint then opens up during front-side mechanics. Hence, the leg is lengthened out again before touchdown, where it is in a stronger alignment to push off the ground. These changes occur during each arm and leg cycle respectively because short levers are quick, and long levers produce force. Elbows open on the down-stroke to create a long moment arm that aids in force production. The same actions happen for the leg on the opposite side. The arms and legs then close up at the elbow and knee joints on the way forward to quickly recover in time to set up for the next down stroke. This is a constant process during sprinting. For coaching purposes, the forward movement of the arms and legs are often elastically reflexive in nature (Schexnayder). For as a result of the back stroke of the arm, the frontal deltoid is put on a stretch reflex, which rebounds the arm forward again. The same with the legs. As the hip, knee, and ankle triple extend at push off, the hip flexor muscles are put on stretch, followed by a shortening reflex in them which aids in bringing the leg forward — With the angle of the knee joint closing to increase angular speed (Tellez). Jesse Owens is often cited as being unique for his upright posture when he ran. However, most great sprinters run upright. Perhaps what made him look very unorthodox is that his arms stayed locked at a 90-degree angle. As great as Jesse Owens was, had he allowed the arms to change angles more naturally he may have run even faster. Ranges of movement should fit the speed. Slower speeds do not necessitate as much force production per stride. There is a correlation between the forward speed one runs and the amount of changing angulation of the arm and leg joints required during a leg or arm cycle. Distance runners move at speeds much slower than power activities such as the 100m & 200m, or long jump approaches. Distance runners, therefore, angulate joints more subtly, and usually run with arms at a relaxed 90-degree angle or slightly less. It would be wasted energy in a distance race to move one’s arms as a sprinter does. 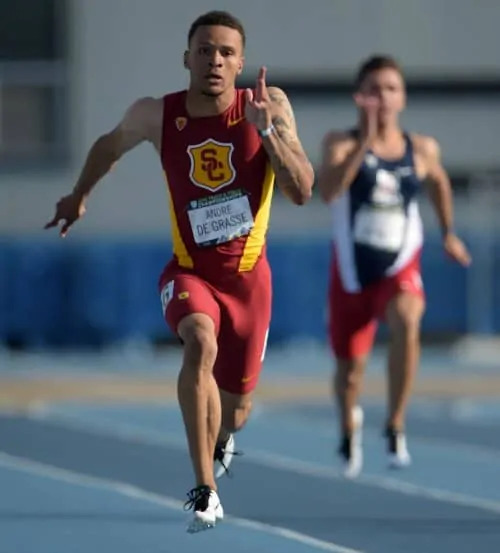 However, a distance runner may do well to move their arms as sprinter once they need to shift gears on their kick at the end of races. Because of the tight spacing between hurdles, male runners in the 110 High Hurdles have modified their sprinting to “shuffle” fast. Great hurdlers have a lower heel recovery per stride. They do not attain full knee lift per leg cycle, and as a consequence of these adaptations it results in the lower leg (shin) not moving through a position any higher than parallel to the ground (Elliott). On account of these factors, the arms have to match the behaviors of legs to be “timed up”, so that the male hurdler’s arm strokes have a smaller range of motion as compared to regular sprinting – closer to a constant 90 degrees angle between hurdles. Female hurdlers on the other hand typically have enough room between the hurdles to run with conventional sprint form (Elliott), and so their arms open and close while sprinting between hurdles to generating maximum forces allowably.